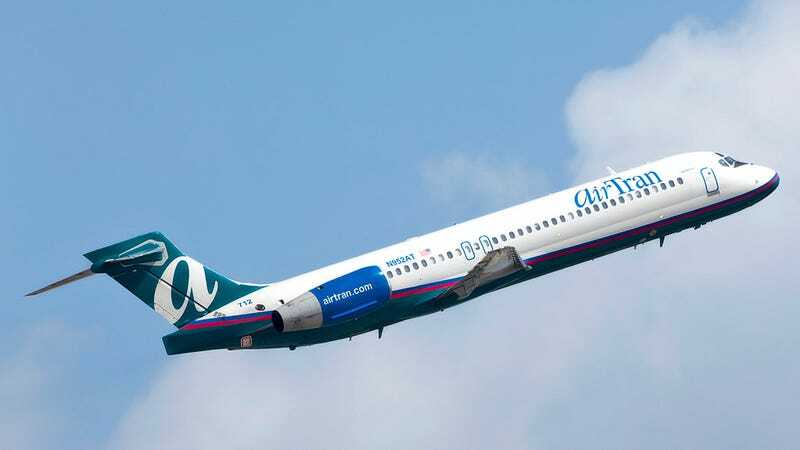 Tonight at 10:25PM, the final AirTran Airways flight will depart from Atlanta and land in Tampa, capping the airline's 21-year run. The final flight commemorates the airline's very first flight, which took place under the ValuJet name, in 1993, and also marks the end of its integration into Southwest Airlines. When ValuJet launched service in October, 1993, they had just one plane, a DC-9 leased from Delta. They flew from Atlanta to Jacksonville, Orlando, and Tampa. They added 15 planes in their first year, while becoming a publicly-traded company. They earned a profit for 1994, the fastest airline to ever earn an annual profit. In spite of the quick growth and money making, the skies weren't always clear for ValuJet. The planes they were adding to the fleet were old planes. Very old planes. At one point, their average aircraft age was 26 years old - the oldest in the country. Those old planes caused mechanical and safety problems, and in 1996, the FAA tried to ground the airline. ValuJet made 15 emergency landings in 1994, 57 in 1995, and 57 more from January to May of 1996 — 14 times the national average. On May 11, 1996, ValuJet flight 592 crashed into the Florida Everglades. The crash of the DC-9 killed all 110 people on board. It was the result of a fire triggered by full chemical oxygen generators that were illegally stowed in the cargo hold without their safety caps, by a maintenance subcontractor. The blame fell back on ValuJet, for failing to supervise the contractor's work. The accident investigation brought more sub-standard practices to light, including planes which had knowingly flown with mechanical issues such as leaking hydraulics and malfunctioning weather radar. ValuJet was grounded by the FAA a month later. Three months later, ValuJet returned to the skies, with only 15 of its 52 planes in operation, all the while hemorrhaging money and customers. A new CEO took the reigns, and in June of 1997, ValuJet announced a merger with Airways Corporation, parent company of AirTran. ValuJet's biggest gain from the transaction was to get rid of their tarnished reputation and branding. At the time, AirTran was a small-time 737 operator, started up by former Eastern Airlines employees. AirTran began to grow as it took delivery of brand new Boeing 717s, and went on to become the world's largest operator of that fleet type. ValuJet had ordered 50 of them, with options for 50 more. AirTran also ordered 100 Boeing 737s in 2003 and began taking delivery of them in June, 2004. In 2009, AirTran became the first airline to have wifi installed on every aircraft in its fleet. In April of 2010, Southwest bought AirTran for $1.5 Billion in a strategic move that was less about eliminating a competing low-cost carrier that it was about Southwest positioning itself against the mergers between Northwest / Delta Air Lines and Continental / United. AirTran also had a pre-existing (though small) network of international cities in Mexico and the Caribbean — one that would help get Southwest onto the international stage. Southwest didn't have the capability to fly internationally, hindered in part by its own reservation system. After the merger, Southwest's route map has grown from 72 to 86 destinations. AirTran is already all but gone. Most of the 737s in its fleet have already been repainted in Southwest colors. Then there are the 88 Boeing 717s AirTran had. Southwest couldn't see a way to make them fit into their route network, so they opted to sublease them to Delta. The 717s (originally called the MD-95, before McDonnell Douglas merged with Boeing) are simply a newer version of the DC-9 that Delta has had in its fleet since the dawn of time. Southwest wanted to get rid of the 717s so bad that they put up $100 million to have the planes outfitted in Delta's paint and interior. Boeing chipped in another $40 million. I flew AirTran once. Well, technically twice. One round trip. Anyway, I'm glad to be able to say I can check another former airline (and the 717) off my list, along with Braniff, British Caledonian, Continental, Eastern, Muse Air, Northwest, PanAm and soon-to-be U.S. Airways. Have you ever flown AirTran? If so, what did you think of the experience? Please share your personal anecdotes with us in the comments below.